The Association of Grace Brethren Ministers each year recognizes three individuals who have distinguished themselves in ministry. The awards are decided by the executive committee of AGBM and the recipients are announced and celebrated at the annual conference. Dr. Larry N. Chamberlain, president and CEO of the Grace Bethren Investment Foundation, was recognized by AGBM with the Excellence in Ministry Award. 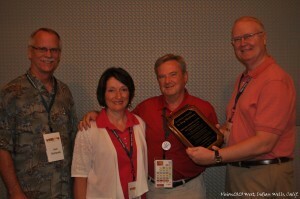 He is pictured with his wife, Sherlene; Joel Richards, president of AGBM (left); and Ken Seyfert, who presented the award. Those recognized at the recent California conference include Grace Brethren Investment Foundation president and CEO Dr. Larry Chamberlain, who was given the Excellence in Ministry Award. Chamberlain has directed the church-planting and investment operations for a number of years, and also has been quite instrumental in leading the Eagle Commission and Grace Brethren military chaplains program, along with John Schumacher. 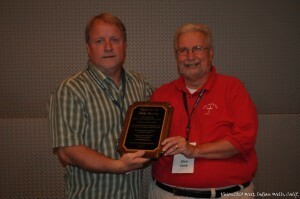 Phil Sparling, pastor of Grace Community Church, a Grace Brethren congregation in Auburn, Calif., was recognized by the Association of Grace Brethren Ministers as Pastor of the Year. Glen Shirk, right, made the presentation. 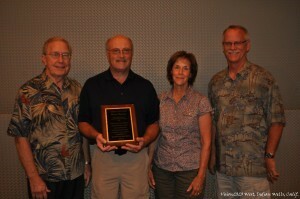 The Pastor of the Year Award was given to Phil Sparling, who pastors the Grace Brethren congregation meeting in Auburn, California, under the name Auburn Grace Community Church. Bernie Simmons, longtime children’s ministry pastor of the Polaris Grace Church (Worthington/Columbus) in Ohio, was awarded the Lifetime Achievement Award for his many years of faithfulness in that position.